"I love salsa. I always make it. I made this one and brought it to work. Everyone raved. It is the best salsa I have ever had. The jicama really makes a difference." Mix together the tomato, jalapeno pepper, red onion, green onion, garlic, cilantro, lime juice, lemon juice, cumin, jicama, and the diced tomatoes with chilies in a bowl. Season with salt and pepper. Allow to sit at least 1 hour before serving. Very good, sweet & flavorful. I think I may leave some jalapeno seeds in next time to make it a little spicier. Added a can of black beans and kernel corn (both rinsed) and did not use jicama. I've made this 3 times and every time it turns out great! 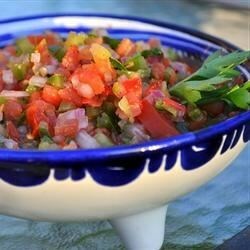 Thank you for this recipe--it's turned me off of store-bought salsa.